The alternating German occupation - French occupation of Lorraine has been ongoing for centuries now. The Lorraine -- Lothringen in German -- region is the only region having borders with four countries: France, Belgium, Luxembourg, and Germany. The location of Lorraine has contributed to its being seen as a strategic asset, and as the crossroads of four nations, it has played a very important role in European affairs. Metz is considered to be the official capital, since that is where the regional parliament is situated. From the 9th Century, Lorraine was part of the Holy Roman Empire, but during the 18th Century, it became part of the Kingdom of France. Following the Franco-Prussian War, the Moselle area of Lorraine was annexed by the German Empire, with the other parts of the region remaining under the control of France. 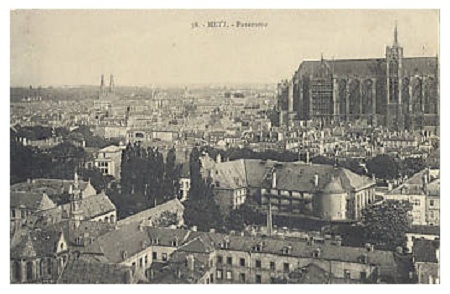 After World War I, the Moselle area of Lorraine was returned to France, and it was incorporated, along with the French controlled areas, into a single region called Lorraine. In 1940, Lorraine was annexed by the military forces of the Third Reich. 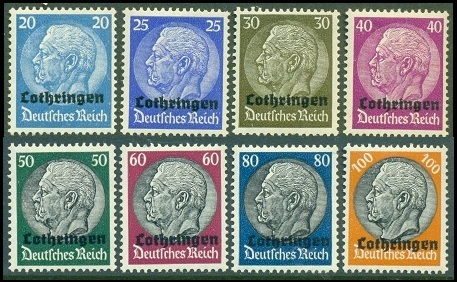 The sixteen overprinted German stamps shown above (Mi. #1-16, Sc. France #N43-58) were issued on August 21, 1940, for use in the newly occupied Lorraine region. 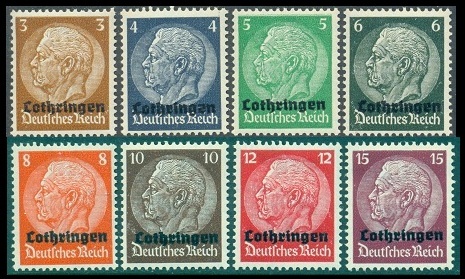 They were valid for postage until December 31, 1941, when they were replaced by the postage stamps of the Third Reich. No noteworthy variations of these issues are mentioned in the Michel catalogs. The set is priced at 36 Euros for mint never hinged condition and 30 Euros for used condition. Thus one can COMPLETE the wartime issues for Lorraine for a very minimal investment! After World War II, the Lorraine region was returned to France, and French postage stamps have been used there since then.